I saved Stephen Jared's latest novel for the plane ride to Hollywood when I flew out for TCM Film Festival. Set in 1936 Hollywod, I thought it would be perfect to read about the very places I would soon see myself: Hollywood Boulevard, Grauman's Chinese Theater, the Blossom Room at the Roosevelt Hotel (site of Club TCM for the festival). Stephen Jared has always been a strong, brisk storyteller, but with The Brutal Illusion he's grown noticeably as a writer. The story is darker, the historical detail richer and his first crack at a female protagonist is both sensitive and fascinating. His Allyson Rockwell is your friend from back home, an innocent in bad circumstances, and while she is responsible for the path she takes, you can't help but understand why ambition overtakes her sense of reason. 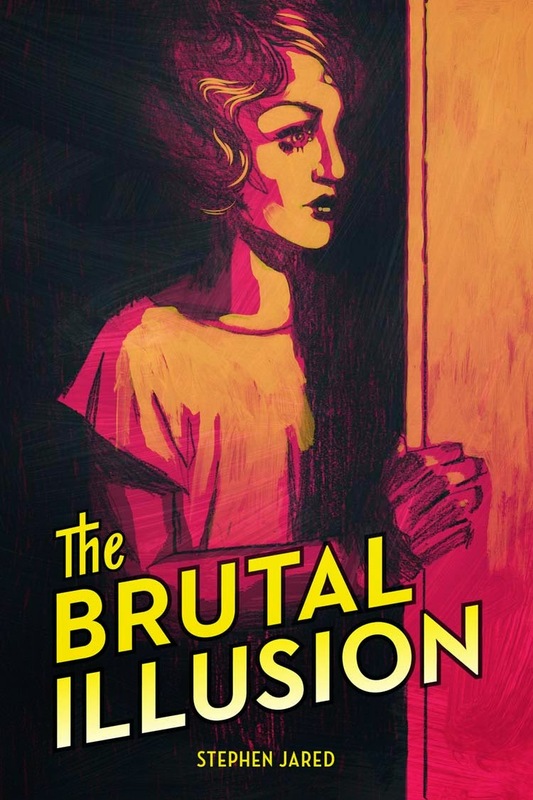 The Brutal Illusion is noir 1930s style. Rockwell finds herself in the moral quicksand of that genre when she takes favors from a mobster in her desperate bid to be a movie star. The way she paid for that bad judgement surprised me. Every time you think you know where things are headed, there's a change in direction. The heroine's sweet relationship with a screenwriter and the small triumphs and glamour she encounters keep things from becoming unbearably bleak, but it is the dark moments that are the most gripping in this addictive little book. It's been great to see Jared develop his literary chops with each new novel. With The Brutal Illusion, he made some interesting choices that really surprised me. I can't wait to see what he comes up with next. Thank you to Stephen Jared for sending a copy of the book. After reading Before the Fact I've grown curious about crime novels from early 20th century, and The Brutal Illusion sounds really good. Thanks so much for sharing! Funny you should mention Before the Fact; I just watched Suspicion the other night and for the first time became curious about the source novel. If you like The Brutal Illusion, you'll probably enjoy Jim Thompson's novels as well. They can be pretty rough, but are so well written.